It's sometimes hard to imagine how life would have been if I had lived in the early 1800's when the country was changing so quickly and women were so repressed. 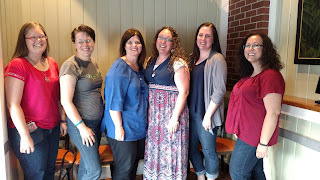 But then Josi Kilpack comes along and makes me feel like Harriet's life could have been my life or the life of any of us because of the common desires, thoughts and feelings that inherently makes us women. 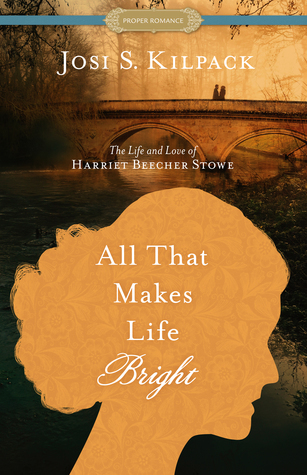 I did not know much about Harriet Beecher Stowe before reading this book other than her famous writing of Uncle Tom's Cabin. I love how personable Harriet and Calvin became to me and how much of myself I could see in them. Kilpack does an excellent job of bringing this bit of history to life and I loved her notes in the back for each chapter. It points to research well done which can be felt in each page of this book. There is nothing heart pounding or edge of your seat in this book. It's simply a story about two people trying to work through the messy bits of life and relationships to find happiness and peace. I felt the connection to the characters and the story. I feel like I now have a better understanding of Harriet Beecher Stowe and I'm the better for it. Content: Some references to intimate relations between a husband and wife with no details. - I received a copy of this book from the publisher. All opinions expressed are my own. 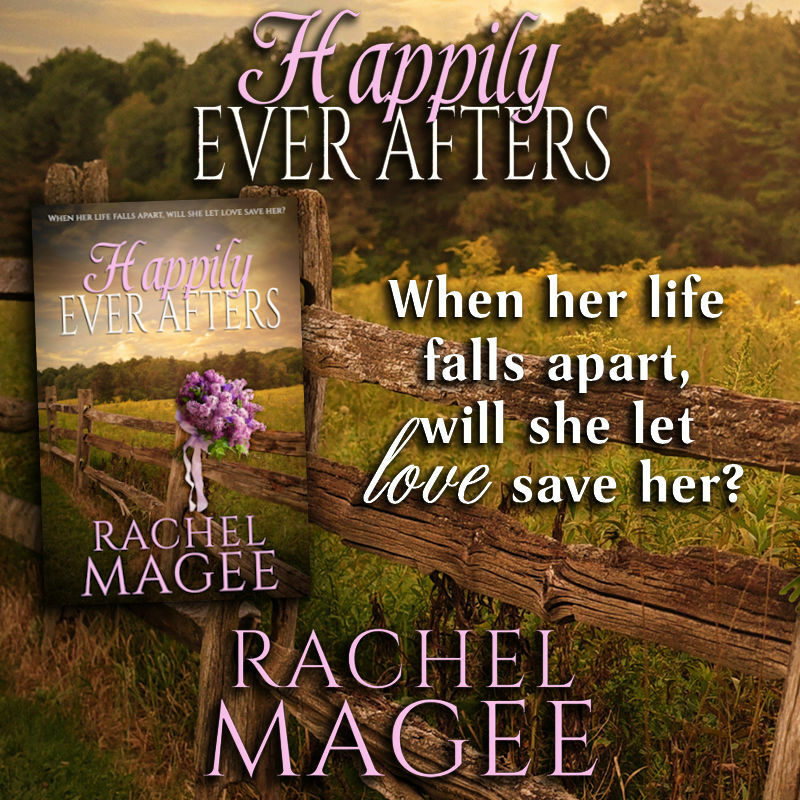 Happily Ever Afters by Rachel Magee + $25 and Prize Pack Giveaway! It's always a bit of a chance picking up a book by an author you don't know and haven't really heard anything about. I do believe this is Rachel Magee's first book and if it isn't, it's MY first book by this author. I was hopeful going in, but unsure. Man, I am SO glad I joined in for this book tour because this book was fantastic. It's more than just a sweet romance, it's a journey filled with emotion and growth. The book starts out in a tropical paradise where two people meet. All the initial feelings of attraction and butterflies were there. It was a fun place to be. Then we move to this middle part where Lainey and Carter navigate a new long distance friendship/relationship. They are both a bit unsure and aware that distance is hard when cultivating the newness of a relationship. Carter is solid though, where Lainey is hesitant. He is honestly the rock star of this book in every way. I LOVED him. A stone in the shoe is irritating. A stone around the neck is a nightmare. Victoria should be happy. Elated. Enemies have been defeated and her new life has endless possibilities. But things never stay uncomplicated for long. Not for her. The wolf essence stone was supposed to cure wolves of their shifting curse. Instead, it adheres itself to her, and casts a new curse on almost everyone surrounding her. Even worse, it speaks to her—leading her to a disturbing and heartbreaking realm where no one can find her and no one can follow. Each time she disappears, she returns with no memory of what transpired and is left with a feeling of dread. Toby suffers more from the curse than the rest of his pack. The wolf essence stone seems to actively hate him and often repels him away from the love of his life. Compounding their problems? A secret society wants the stone for their own nefarious ends and the evil witch who created the curse has also resurfaced—and everything they do puts Victoria’s life in jeopardy. All the supernaturals must band together in an epic battle for control of the stone. But before it’s over, one or more of them may have to make the ultimate sacrifice. Paranormal characters are in full forces in this story. 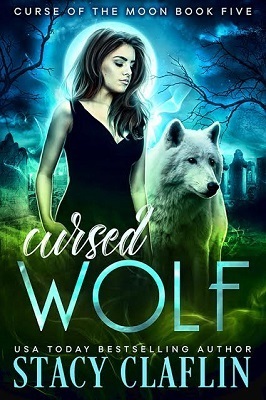 Witches, werewolves, valkyrie, vampires, shape shifters, you name it, it's probably in this book or in this series! One thing I really loved about this book was the sense of community and family in the core group of characters. They work well together and look out for each other. Individually I didn't feel much emotional connection to the characters, but I really enjoyed them as a whole. The beginning of this book is a bit slow as everyone is fawning over Victoria but things do pick up resulting in a very climactic ending. The author leaves a few openings for future books which look promising- especially the one involving the Jaguar! Content: mild violence, kissing, implied intimate relations between a married couple with no details. - I received a copy of this book from the author. All opinions expressed here are my own. 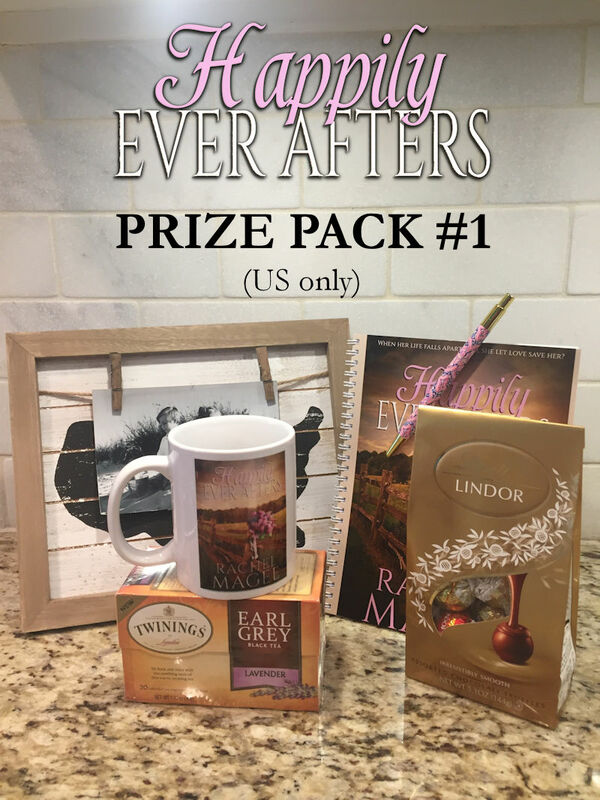 The Pursuit of Lady Harriett by Rachael Anderson + $25 Giveaway! When wills clash and hearts collide, who will reign victorious? I was a bit worried in the beginning of this book because Harriett was such a brat! I thought, "oh no, I don't like her at all!" And in the beginning of the book, I really didn't like her. She was mean. Christopher was a bit oblivious, but not really deserving of all she dished out to him in the beginning. This started a bit of a war of sorts- each trying to up the other one because Christopher is not one to stand there and take anything. It was a bit amusing, I have to say. There was some excellent banter and some sparky moments of romantic tension. Harriett grew on me- especially as her softer side began to emerge. I loved Christopher from the beginning. He's a funny guy. And so very oblivious. The ending was superb. There was such a build up throughout the book which made the ending ever so satisfying. I loved it. This book was engaging and fun the whole way through. If you haven't read this series, you need to. It's so, so good! “I do not feel at all burdened, sir.” Indeed, Harriett suddenly felt breathless and somewhat giddy. The effect this man had on her was something of a wonder. He laughed—not a tired attempt at a laugh, but a real one filled with the richness that warmed her straight through. Only this time, it did not bother her at all. In fact, it felt wonderful, almost like a compliment. Harriett tried her best not to blush or appear astonished by the suggestion—he had obviously made the comment in jest—but when his smile widened into a devilish grin, she knew she’d failed. He leaned in closer, and his gaze wandered briefly to her mouth before returning to her eyes. She could smell vanilla and lemon and a hint of something else—leather perhaps? A delightful pulse whipped down her arm, and she was hard-pressed not to shiver. 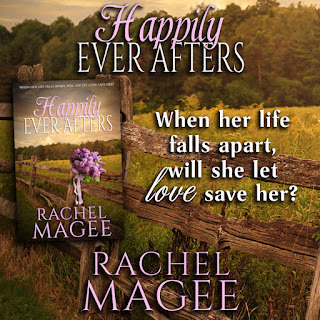 Will she risk the home she treasures for the man she loves? Cypress Grove has always been a treasured constant in Layla's perfect life. Now the mansion will be sold to the highest bidder if she doesn’t date an investor's son. The problem? The man she really wants just rolled into town. Tyler is done being responsible and never going after what he wants. Layla's finally given him the courage to quit grad school and use his student loans to flip houses. And he's decided to move near Cypress Grove to do it. When Layla happens upon suspicious ledgers at the mansion, her family's financial woes take a sinister turn. As Tyler and Layla work together to find the culprit, the attraction between them threatens to burst into flames. But admitting their feelings could spell disaster for Cypress Grove. 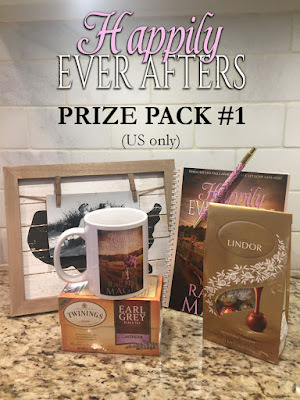 I think I'm going to love this new Destined for Love series with the theme of mansions! The last series set in Europe was so fun and this series has a great line up of authors. I'm hoping to be able to read then all in the next couple months. Fingers crossed! 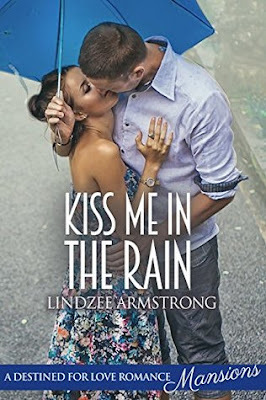 Kiss Me in the Rain follows a couple that we meet in a previous book, Kiss Me in the Moonlight. It sets the stage for this book although I don't think you need to read the first book to understand the second. But, as with all books in a series, you will probably feel more of a connection to the characters if you do. This story was easy to picture in my head. I love when I can read books and fall into a movie as well. I can't wait to read the next book in this series! Hopefully next week! First of all, I really love this cover. It's so bright and happy. 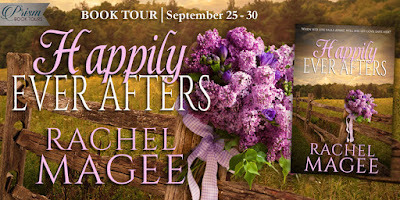 And, like the character in this book, my grandma had lilacs in her yard and I loved them. I planted a lilac bush in my yard and it always reminds me of her. 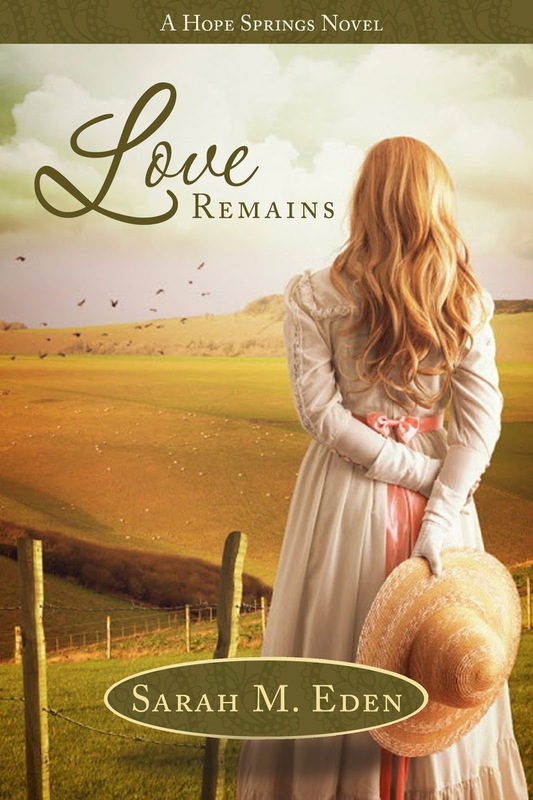 This is an LDS fiction book. There are religious elements in it- more than just casual Christian mentions. I loved the characters in this book. I think Charlotte and Jack are fantastic and I would love to have them as my friends! They have so much personality and it's well defined so that I feel like I know them. The book takes a location change to Brasil and it was fun! It made me want to visit there myself. 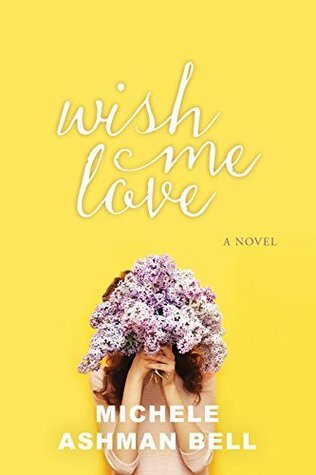 I loved the bracelet and wishes part of the book too. It made Charlotte's life feel a bit magical. The story lost some momentum for me in the middle when the more religious elements came into play. I'm a religious girl, but I felt like this just slowed the story down and went on too long. That's just me though. The HEA ending happened VERY fast. Over in an instant. I guess I just wanted more between the couple AS a couple- I waited so long for it. No epilogue. <sigh> It's okay though. I really did enjoy this book for the most part. Content: Just the religious themes mentioned above. Mind Games by Stephanie Black + $25 and Book Giveaway! 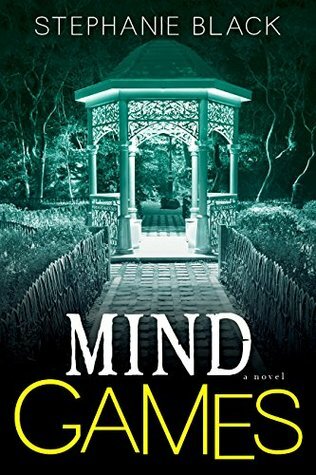 Stephanie Black is so good at writing these suspense/thrillers. What a mind she has. I appreciate that she is able to write in this genre and keep it clean. 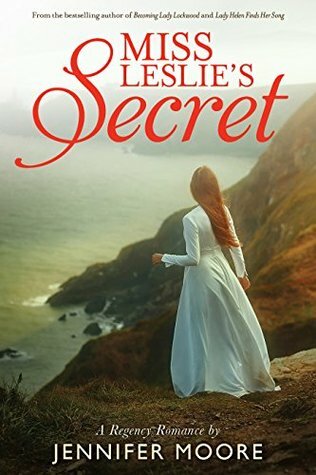 No lady can steal a loyal man from his fiancé, but what if that lady is a ghost? 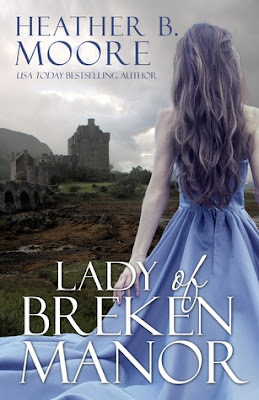 LADY OF BREKEN MANOR will be released in the Secret Legends Boxed Set on September 12, 2017. Secret Legends will be available only for a limited time at the low price of 99 cents. LADY OF BREKEN MANOR will be then moved to an individual release in December 2017. How fun was this book!!?? I love reading romance books with a little twist off "normal". I mean, a boy falling in love with a ghost? He never touched her, he never kissed her. He only spoke with her but the connection was forged and there was no going back. There were plenty of moments in this book that made me smile and then there was Sean. Oh, hello Sean. Guy in love with the ghost. You may think he's a titch off in the head but I'm telling you that he has some awesome swoony moments. I loved his devotion to Lady Charlotte. 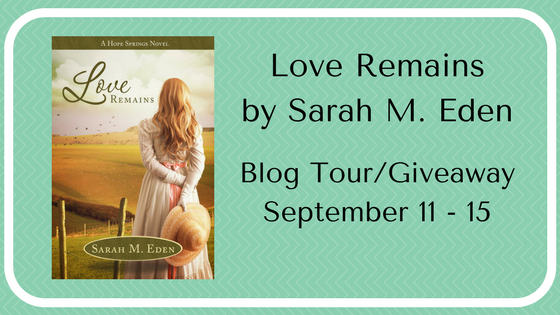 Love Remains by Sarah M. Eden + Giveaway! 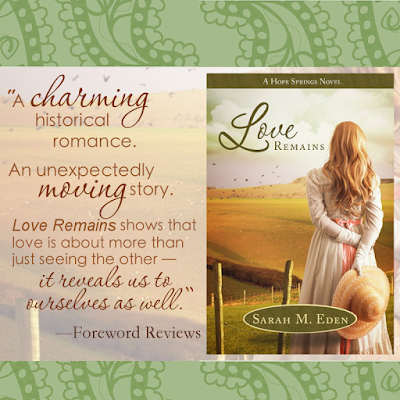 It's no secret that I love Sarah Eden's books. This series is absolutely one of my favorites and this book? Oh my heart. Seriously. It's full of depth and emotion and my heart was one hundred percent engaged. I have loved Tavish from the very beginning of this series. I think I might be in love with his name alone! Tavish is the very best sort of person and I was SO grateful this book brought about some healing, peace and happiness for him. It was a long, hard fought battle- emotional and fantastic. Man, I love Tavish. LOVE him. Cecily earned a place in my heart right next to Tavish. She sort of wormed her way in and took up space. It happened with no conscious effort on my part. 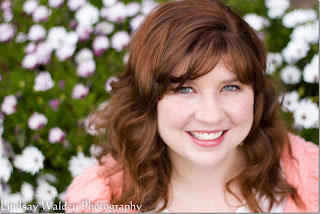 I felt all sorts of things for Cecily but mostly I admired her. She has a strength of character that I wish I had. She is someone who rises up no matter what. Through heartache, prejudice, physical pain and limitations, loneliness and sorrow, Cecily rises up. I could seriously go on and on about this book. I really loved everything about it. There is a song in this book and a scene that yanked my heart out. If you have ever loved someone and lost them, you will feel it's power. So emotional! I would highly recommend reading this series and in order if you can. It will provide more of an emotional connection this story and it's characters. But, if you cannot read them all, this book can stand alone, I think. Miss Leslie's Secret by Jennifer Moore + $25 and Book Giveaway! After high school Sydney's friends scattered to different colleges across the country. Over Thanksgiving break they are reunited, and much to Sydney's surprise, she discovers that her best friend has kept quiet flame for her for years. Sydney is faced with making an impossible decision: stay with the perfect boyfriend or go for the best friend who s always loved her? 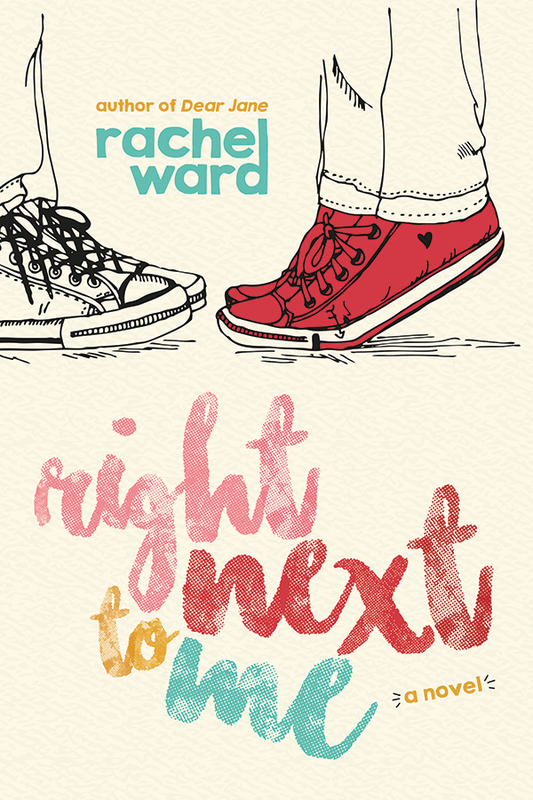 This coming of age story is full of big life decisions for Sydney as she navigates home and family responsibilities, relationships and school. The author did a great job of capturing that time in life where so many big things are happening and change is inevitable. I enjoyed getting to know Sydney through present time and a series of flashbacks. Sydney is an easy character to like. I love the support and help she gave her mother in caring for her siblings and home responsibilities. This is the kind of book that is easy to recommend to teenagers on up. There is no swearing or sexual content aside from some kissing. The characters make (mostly) good decisions and learn valuable life lessons along the way. It was cute and I enjoyed the journey! Oh, and I love the cover and the colors involved. It's so cute!! 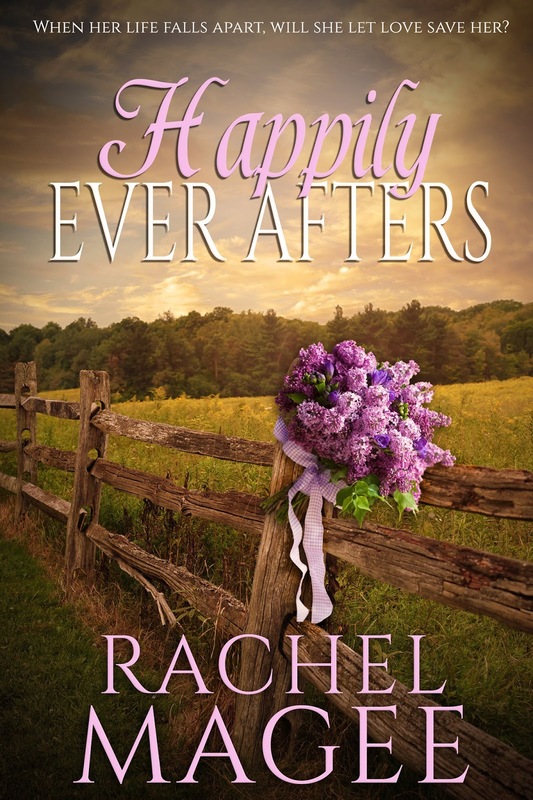 Rachel grew up reading every book she could get her hands on and spending time with her cat. At least, that was the report in every annual Christmas letter. The humiliation was enough to spur her into action, and she began writing, and never stopped. 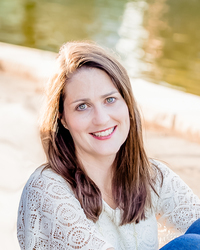 Rachel studied English at Brigham Young University-Idaho and then blogged and wrote in between the births of her six children. She currently lives in West Jordan with her family, and while she no longer has a cat, she still reads every book she can get her hands on. Right Next to Me is her second novel.